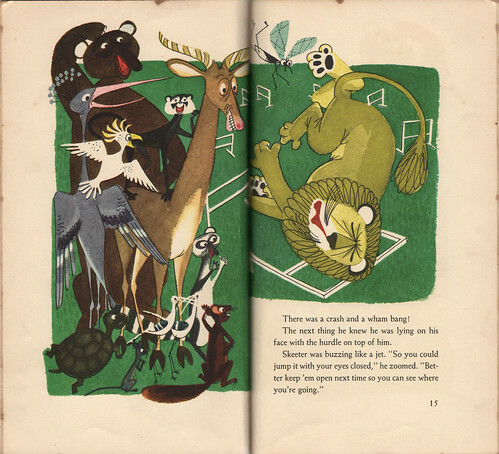 I completely forgot I had this book, but you can thank Leif Peng for sparking my memory. 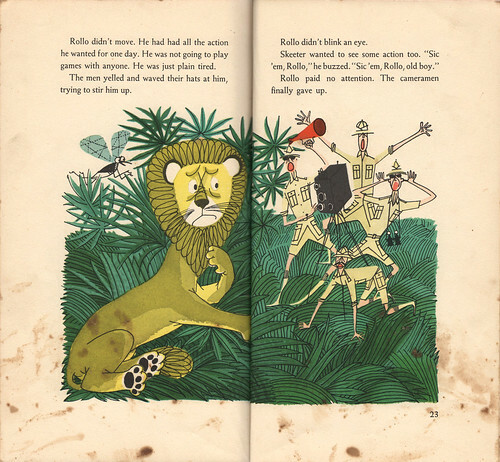 This past week, Leif focused on the work of the great Jan Balet, an inspiring illustrator who did some marvelous work in magazines and books throughout most of the mid-20th century. 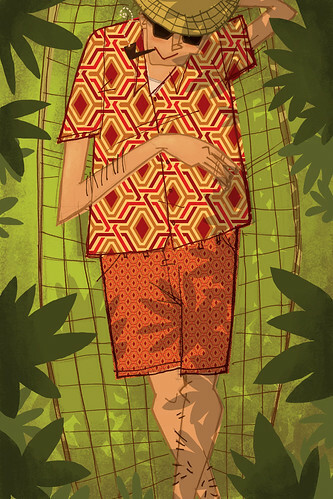 There's not much out there about the artist, but Leif has been able to acquire enough details to get a pretty good grasp of his brilliant career. (And I find it interesting that since there's no account of his death that it's possible that he could be still alive at the ripe old age of 95.) Balet's range was amazing, and the length of his career is testament to that. 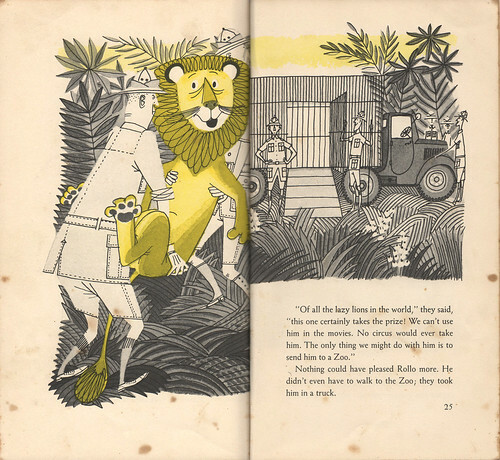 The Lazy Lion; story by Helen Wing, pictures by Jan. B. Balet. Published by Rand McNally. 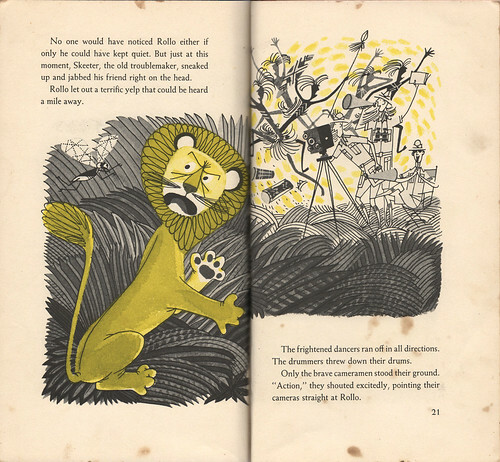 First printing 1953. 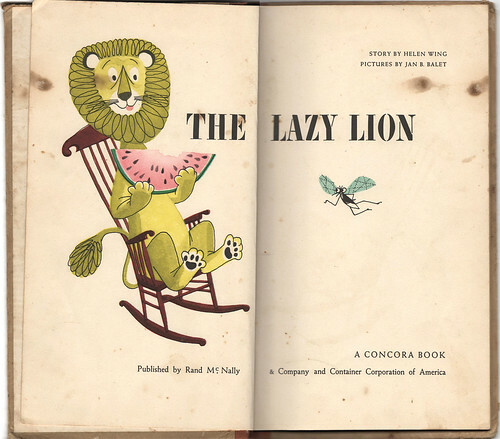 The Lazy Lion was this inconspicuous book almost overlooked by me in some forgotten antique market bookshelf, mainly because of a bland cover (no dustjacket). But imagine my surprise when I opened it and found some fantastic work by Mr. Balet! 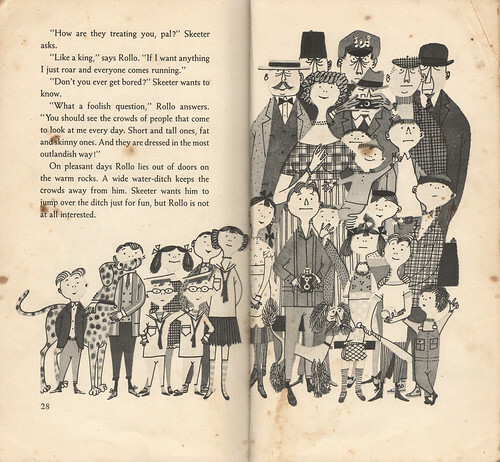 I was already aware of his work from a few advertisements in various women's magazines -- this was my first encounter of any of his children's book work. 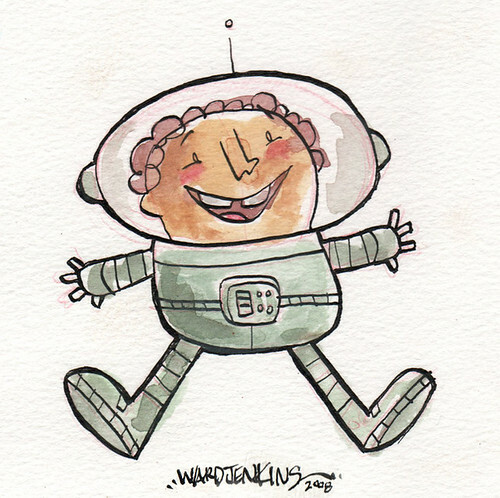 Love his whimsical style and fun characters. I'll say it again, I love it. 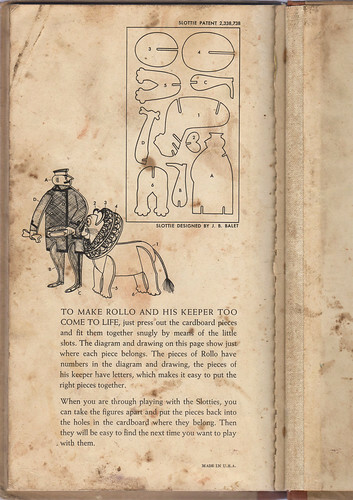 The book wasn't in the best of condition, with some staining throughout the pages, but I decided not to photoshop them out. Would've taken too long, plus, it kinda looks neat. None of the artwork is affected. At least, not too much. 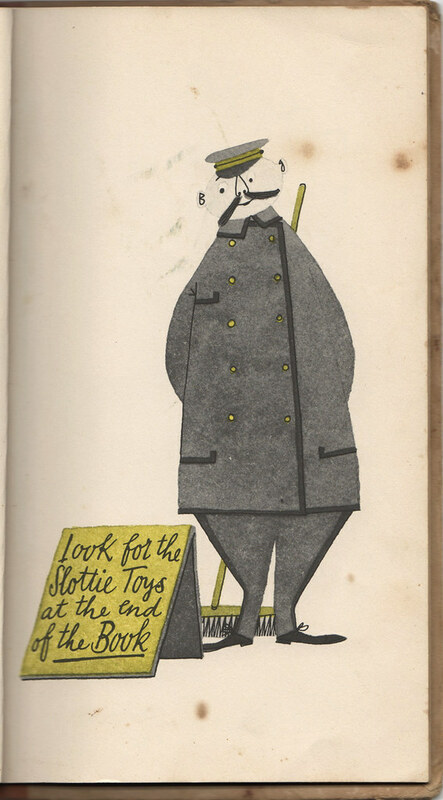 Sorry, but no 'slottie toys' were to be found in the back of the book (see below). Already cut out and put together by some lucky child. Probably long forgotten and thrown away by the parents when their kids' grew up. Oh well. The book was bound too tightly in the spine, so we lose some of the artwork in the gutter there. I tried my best to get as much of it as possible. Great poses here and below. Click here to view these images from The Lazy Lion in a Flickr set. Leif's Jan Balet Flickr set. Jan Balet on Today's Inspiration. 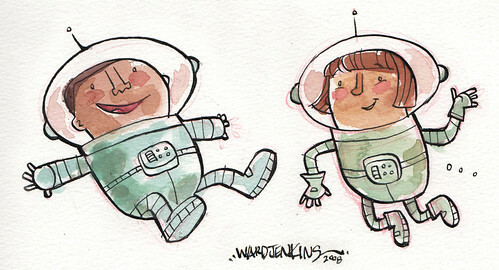 I painted these astronaut kids a couple of weeks ago. Goauche and india ink on watercolor paper. I really enjoy working in this style. 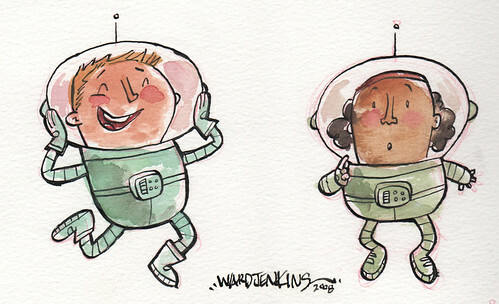 The ink is waterproof once it dries, but I could've painted the kids first and then applied the ink afterwards. It's all a matter of preference. Even though goauche is utilized more as an opaque medium, it behaves like watercolor when you add more water to the pigment. I think I need to get new nibs. 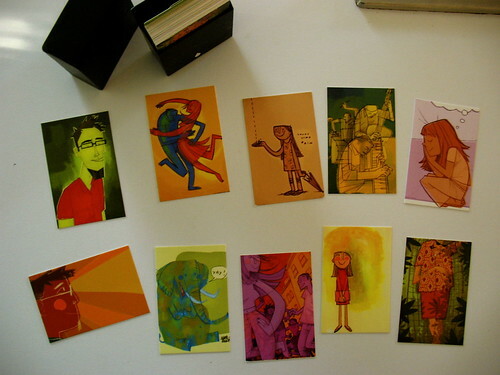 The one I used in these illos is several years old and is starting to fray. 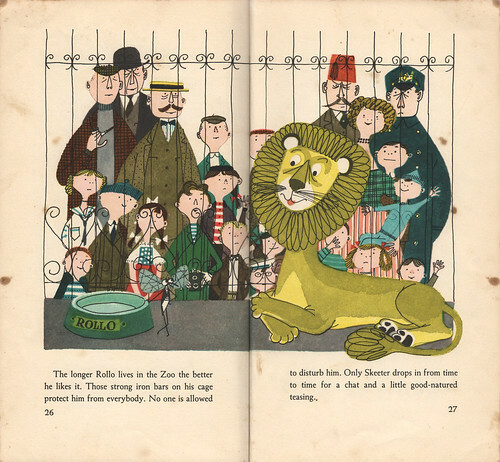 I'd love to work on a children's book using this technique. *hint hint* Any takers? With sudden independence comes great responsibility. I'm learning to embrace the independent lifestyle of the freelancer. It took a while, but I'm starting to open myself to the possibilities. As a fulltimer, routine took over and I would easily lose my focus with the job at hand, thanks to the cushy, steady paycheck, the typical ebb & flow of work, the overall constant of daily tedium. Like a tide that slowly eases in and out, over and over, lulling me into a deep sense of complacency, I found it hard to be on point. Deep down I realized that maybe this wasn't for me. I'm justifying all this, of course. It would be nice to have all the benefits that a fulltime job offers an employee -- makes life easier, right? Yes, of course it does. Who am I kidding? But now, being on my own, my appreciation for working has vastly increased. With each new job awarded I'm fully awake and alive, attacking whatever project head-on and staying completely focused. Something about the timeframe in between each job that shakes me awake and makes me fully appreciate the fact that someone has given me an opportunity to do something special here. I cherish it like there's no tomorrow. Like it's the only job on earth. Collect all 10. Thanks to the fine folks at Moo. Big thanks to everyone who either commented or emailed me on my last post. It's good to know that there are others out there who are willing to help out, especially when it comes to Flash. I actually have a good lead in learning the program, one that allows me the time to get to know it on my own timeframe. I also checked a book out on learning Flash, which should help me out to a certain degree. I've been meaning to mention this earlier: I was recently interviewed on Frederator by fellow animator blogger Floyd Bishop. He called me up and we had a grand ol' chat about animation, illustration, and everything in between. Are you into listening to two animation geeks talk shop? Then mosey on down to Frederator Blogs and have a listen! I miss animating. I haven't worked on my short film since June and I'm deeply feeling the loss. Once the craziness of the next couple of months pass, then I'll happily jump back on it. I've found plenty of job openings for the positions listed above. If you're wanting to do any of these particular jobs, then you're in luck because with each job search done on the umpteenth animation job search website (and otherwise), tons of companies are needing Flash animators, Maya animators, TD's, compositors and TONS of web design work. Not sure if the pay's going to be any good (for Flash, that is), but hey, the opportunities are there. I've been asked if I can do Flash so many times it's not even funny. Looks like I need to start learnin'. I can do After Effects, but not to the extent that some companies are asking when it comes to A/E work. Usually they need some serious compositors, not just some dude who's done mostly animatics and moving storyboards. I know a few things in that program, but not all the bells and whistles that that program has to offer. I'd love to stay in Portland because we've slowly immersed ourselves into this community, and we've come to love this town more and more. I'd understand and respect the fact that if a great opportunity should happen upon us we'd have to move, but really, we'd love to stay if at all possible. I've finally entered the 21st century and registered my domain name. 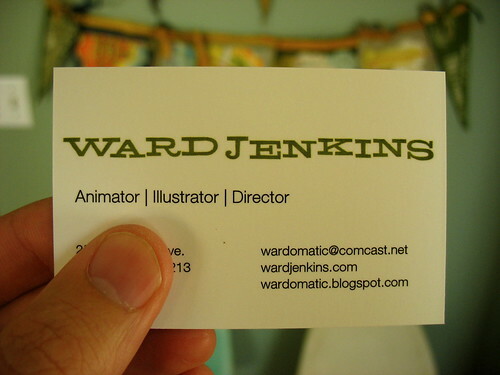 Wardjenkins.com will be up and running soon. However, it's taken me a lot longer than expected. I'm trying to learn some basic Dreamweaver as I go along -- this along with doing storyboards and working on my portfolio and so on and so on....I'll probably have to employ a friend to help me with this endeavor. Yikes. Because of my current situation, I've decided to go to the Ottawa International Animation Festival, even without any money. As some of you may know, I'm a big fan of festivals, especially OIAF. This'll be my fourth time going, but first time completely unemployed and looking for a job. It feels like this year I'll be a true, active participant in the game, whereas the other times I was merely a spectator. Participant meaning in the manner of landing a job -- on that Saturday there's Animators For Hire, a recuiting event that's always eluded me because, well, I was never looking for a job. Expect to see my bright and shiny face at this thing this year. Going to Ottawa will be a strain financially, but I've been able to enlist some help to at least get me there (thank you thank you thank you -- you know who you are). Now, all I have to do is find someone willing to split a hotel with me. An art show? A solo show? You've got to be kiddin' me -- that's what I said to the guy who owns this cool little gallery here in Portland. I'll post more about it at a later date, once all the details are ironed out. But, yeah...crazy, isn't it? Can't believe it! Funny how I haven't posted as much here as I thought once I was let go from my previous employer. I thought for sure I'll be boring the tears out of everyone by my incessant blog activity. But no, it's been relatively quiet around here, hasn't it? Priorities change when careers are on the line. Funny how that is. So, we'll see how it goes with Ottawa. I hope that something works out. I'm sure it will -- it always does, doesn't it? Especially when I have family and friends supporting us, giving us that extra push needed.